An artist who claimed to have vandalised nearly 50 cars in the name of art has admitted it was a stunt. Mark McGowan, 37, said he had taken pictures of himself scratching vehicles' paintwork as part of a project. But the London performance artist has since admitted the cars were already "keyed" and the photos were "staged". He said it had been an art project that had gone "horribly wrong" and said he was "very, very sorry". "I never keyed any cars...the whole thing has just been a nightmare," he added. "All I wanted to do was highlight the plight of people who have had their cars scratched, which has somehow spiralled out of control. "My family and friends have shunned me and someone rang into a radio show and said they wanted to rip my head off. "But at least I've shown people do care about car crime." Mr McGowan said the cars in two of the pictures, taken for his latest exhibition, belonged to his brother-in-law and a barmaid from a pub in Camberwell, south London, and had already been scratched. The Met police had said on Monday that if any criminal allegations were made they would be investigated. Mr McGowan's latest project is just one of many bizarre stunts by the artist who describes himself as "the British alternative to David Blaine". 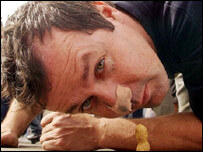 In 2003, he used his nose to push a monkey nut seven miles to 10 Downing Street in protest against student debt. He also rolled on pavements for four miles across London singing Christmas carols to highlight the work of office cleaners.